I’m back. I guess you’ve all been wondering where I’ve been in my absence. Writing the next Pulitzer winning prize fiction or the Queen’s next speech? Unfortunately not. Yes, yes I know it’s hard to believe. But there I was at the kitchen sink with my Marigolds immersed in the soap suds when suddenly I was bathed in an ethereal light. My toes rising from the floor, a gravitational pull elevated me towards the ceiling. Had I drunk too many sherries or were the flatulent side effects of the herbal diet pills working overtime? Before I had time to use my litmus test, a huge WHOOSH reverberated in my ears and I found myself transported to another dimension, imprisoned in a glass cell aboard an alien spacecraft. Oh no! What gross, sick and disturbing experiments awaited me?! Perhaps I would be tested for endurance by watching endless repeats of Freddie Mercury leaping up and down in his harlequin suit? Or maybe the 1981 Royal Wedding? Or maybe just Gordon Brown attempting to speak sincerely? With these terrifying thoughts spinning like a carousel in my mind I was soon a gibbering wreck; eyes rolling, saliva dribbling and cowering like some wretched animal awaiting a mercy killing. Then they came, out of the dark recesses, ghostly apparitions resembling the figures of men. Had the green, bulbous creatures with nine eyes and forked tongues which I had imagined as alien beings ever since watching the Teletubbies metamorphosed into human form? What vile plot had I unwittingly become involved in? An alien conspiracy to subjugate the female species by impersonating Gorgeous George? “No, no, no!” I screamed, whilst admiring George’s silver lamé suit against the flecks of grey in his hair and his omnipotent looking light sabre. Well naturally, I fought. Tooth and nail. I mean you have no idea how hard. Seriously, seriously, hard. Until I was totally and utterly exhausted. Then, just as I found more energy to continue frolic… fighting… I found myself back at the kitchen sink, my hands still in the suds. Had it all been real or were the herbal diet pills causing delusions? I wasn’t taking any chances; so I got out my magic beans and threw them out of the window. Whoa, Whoa! Warning, warning! Red Alert! This is an emergency situation. We are in foreign language mode! Close the book or take the paracetamol now! And more often than not I would close the book. However, something has happened to me recently because my eyes have been reopened to science fiction. How did this happen? 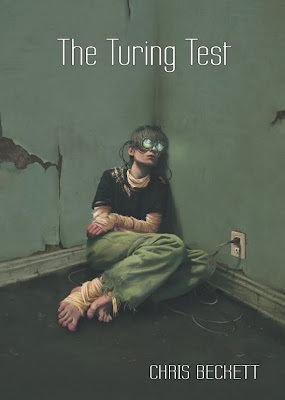 Well, a few weeks ago I met science fiction writer Chris Beckett winner of the 2009 Edge Hill short story contest for his collection of stories entitled The Turing Test. The Edge Hill Prize has only been in existence since 2007. However, as a result of his win Chris has already been boldly going places he has not been before. (Sorry, had to get that in!) As the only competition that rewards a collection of short stories by a single author in the UK and with a healthy £5,000 prize it attracted some big names into the arena this year including Shena Mackay, Ali Smith and Booker prize winner, Anne Enright. But as the victor, Chris Beckett’s star is now on the rise. Having written for the science fiction magazine Interzone for years his recent success has finally secured him a two book deal in the UK with Corvus. The first of his two full length novels The Holy Machine which previously had only been published in the US will now be printed at home where his work is, at last, being given the recognition it deserves. The success of The Turing Test is not a token gesture towards science fiction writers as some might suspect, but a truly worthy winner. It contains 14 short stories all of which are easily readable and enjoyable. The key for me was that the science fiction element was secondary to the story. Time machines, virtual worlds and futuristic societies were just tools to illustrate Chris’ insightful view of the human psyche and the way we currently live. His view of the future, whilst being fantasy, also has an element of worrying truth and possibility. It made me ask questions about the direction of our society - and whether or not I like it. 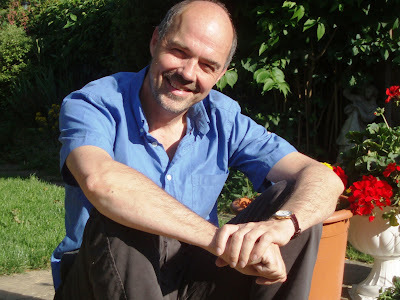 Chris has a background in social work and as well as being an author he now also lectures in social work. I’m inclined to think that a lifetime observing some of the more problematic aspects of society has given rise to some of his intriguing ideas about our future world and how individuals might function within it. Relationships, loneliness and self knowledge (or lack of it) are all addressed in what is at times quite a melancholic collection of stories. Yet, despite this underlying sadness, I felt that there was something to learn, to understand in these tales. They were stories that made think and feel and that, for me, is always a winning combination. So back to my meeting with Chris, who I’d met at a reading he’d been giving at a local library. Interestingly, in the discussion afterwards it became apparent that I was not the only one who had, perhaps misguidedly, thought that science fiction was the prerequisite of laser guns, shuttles and space gibberish. As Chris pointed out, 1984 By George Orwell is actually science fiction but no one refers to it as science fiction. So what exactly is science fiction? Of course they are sub genres within science fiction like space opera and cyberpunk which may be more technical and extraordinary but generally a good proportion of what we read is “science fiction” but we just don’t recognise it as such. Well I thought about Chris’ comments and realised just how many books I’ve read could be classed as science fiction; recent reads such as Blind Faith by Ben Elton (a must read for every blogger and internet lover) and Never Let me Go by Kazuo Ishiguro (nominated for the 2005 Booker Prize and soon to be film starring Keira Knightley) and old reads like 1984 and On the Beach by the perennial favourite, Nevil Shute. Maybe, as Chris pointed so aptly pointed out, if a book is about the future then it is actually “science fiction”. Not so long ago a friend of mine asked me if I’d read The Hitchhiker’s Guide to the Galaxy because she said it was just my sense of humour. “Nope,” I replied, “that science fiction thing puts me off.” Well I guess I finally need to read it because now that I’m back into science fiction mode I’m ready to take it on. Anyway, I’ve always liked phasers and probes. Sci Fi author Chris Beckett - looking surprisingly normal. Blast. Now if you’d like to win signed copies of Chris’ novels The Holy Machine and Marchers leave an answer to the following question on this post. George Orwell wrote 1984. He also wrote Animal Farm. The pigs in Animal Farm were called Old Major, Snowball and Napoleon. If you had a pig what would you call it? The answer that appeals most to me will win Chris’ books! My decision is final, absolute and will entail no reasoning or logic whatsoever. Small bribes and flattery are strictly allowed. I don't "do" pig names. Could we get back to George Clooney? You said he was wearing silver lame'. Really? When he came to my house, he was wearing grey flannel. The silver lame is so tacky, just doesn't sound like "my" George. But to each her own, I guess. Now that is the kind of logic I like:) A little bit twisted but nevertheless excellent! No plans to get a pig but aren't they great? Don't they share a lot of our DNA too? Not meaning to upset the pig but how about 'Prescott'? Or, if it was a girl, 'Tracy'?! If I had a male pig I would name him Emsworth, for obvious (I hope) reasons. A female pig would be named Maude, just because it seems pigly. I am definitely a science-fiction fan as well as a Wodehouse fan. Sir Frances Bacon (Mrs A) Nice one Mrs A! Historical Bacon? Appeals to my sense of history and yet at the same time my tummy.... Mmmm.